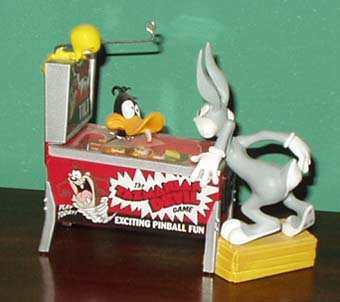 Some pinball enthousiasts start to collect everything about pinball machines.. up to every object in which a pinball machine is featured. 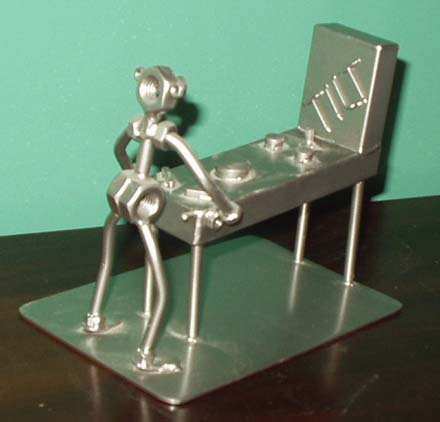 Here is an overview of some pinball statues that have been made. If you know of others or have more information then let me know so I can add it. Large metal 'nuts and bolts' statue by Hinz & Kunst. Made around 2002 and was available in gift shops, price was around 75 euros. Sold out since 2 years, but it seems they can be ordered in Germany for around 40 euros. Some of these (reproductions ?) are identical, others are on a flat round base instead of the square box. Another type of nuts and bolts statue of a pinball machine. 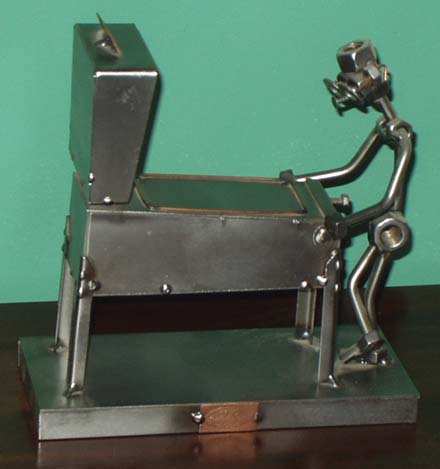 Sold through a dutch website, I have no idea who makes this. Price was around 30 euros. Also available in an x-rated version. Statue made by a dutch artist/company. Not for sale. 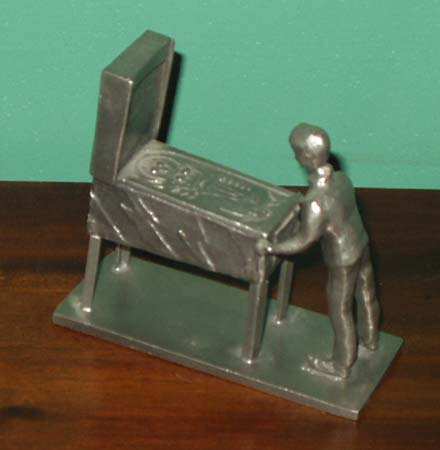 The Dutch Pinball Association gives these to winners of their championships. The statue in the picture is slightly different and was made for a dutch company. Made in 2003 by Demons et Merveilles. This represents french comic book hero 'Lucien'. Price was around 30 euro. Made in resin. Sold out but can sometimes be found on ebay. In 2005 Demons et Merveilles made a statue about the Joe Bar Team. It's a humoristic comic book series about some friends in Paris who drive their motorcycles everywhere and hang around in pubs (playing pinball machines). 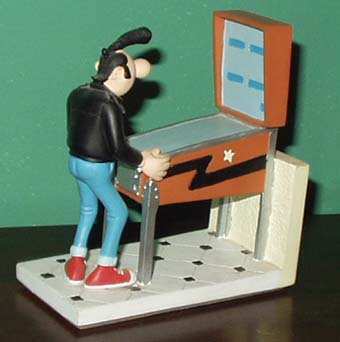 List price is 275 euros (for that money you can already buy a real pinball machine). Still available in some shops. Limited and numbered run of 1334 pieces. 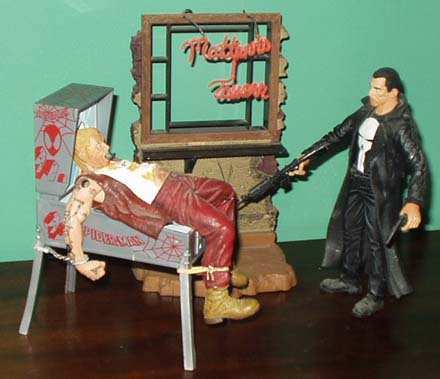 The Punisher action figure by Marvel. 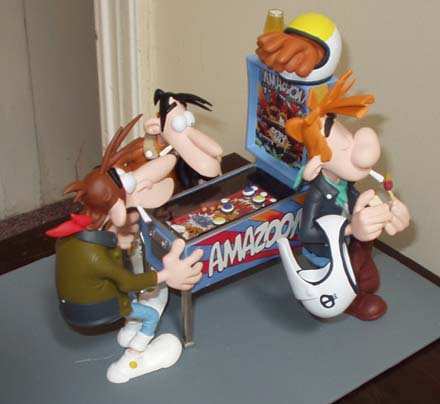 I believe it was made in 2003 and is already sold out, maybe it's still available on ebay. An ornament to hang in the christmas tree. Very nice ! Made in 2005 by Hallmark. Features Taz, Bugs Bunny and Tweety. Pull the plunger (there's a real ball in it) and it lights and makes pinball sounds. Still available (check ebay) for around $20. Fridge magnet. Sold through some pinball parts shops. Makes sounds. 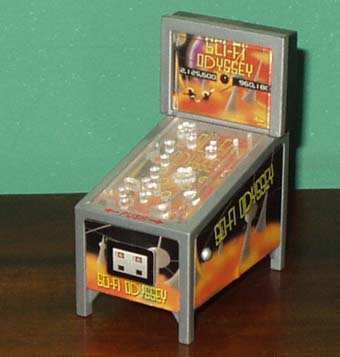 Miniature pinball machines are also hand made by a french collector. Check his homepage.